Although heavy main-line electrification was investigated in the United States long before it was considered in Europe, the amount of American electrification is but a fraction of what has become a major propulsion method for overseas railways. Thomas Davenport of Vermont built an electric traction engine in 1837, which he operated on a short stretch of track. By 1850, experiments had begun in Europe without any measurable results. These experiments did inspire the U.S. Congress, which authorized Professor Charles Page to build an electric locomotive. Unfortunately, government enthusiasm was premature as the design of electric motors was not sufficiently advanced, and no more funds were forthcoming. The Berlin Exhibition of 1879 included a small electrically powered locomotive built by Ernst Werner von Siemens and Johann G. Halske, which pulled carriages around a circular track while drawing cur rent from a middle third rail. Amazingly, the locomotive survived even the bombing during World War II and is on display in the Deutsches Museum, Munich. Siemens and Halske opened the first public service street railway in Lichterfelde, a suburb of Berlin. The early 1880s also saw electric traction installations in Brighton, England, and Portrush, Giant Causeway, Ireland. In 1880, Thomas Edison demonstrated a small locomotive that reached a speed of 40mph (64 kph). The 1885 electrification of the Richmond ( Virginia) Union Passenger Railway inspired rapid growth in electric street railways. That was also the year that Frank Sprague patented a system in which several electrically powered street cars could be controlled from a single motorman in the lead car. This is the basis of the control system used in virtually every commuter railroad and transit system today. Many early electrification projects were undertaken to eliminate smoke pollution. The B&O built a 3 (6km) mostly underground connection, including the 1 1/2-mile (2.5 km) Howard Street Tunnel, to accommodate rail traffic across downtown Baltimore. General Electric built tunnel motor No. 1 in 1894 to pull steam trains up the tunnel grade, thereby avoiding exhaust problems. In 1895, the Baltimore & Ohio (B&O) became the first American railroad to take advantage of electrification. 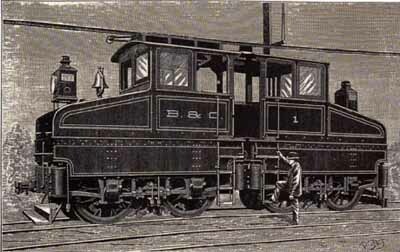 Responding to an ordinance banning steam locomotives and their smoke within the limits of Baltimore, the B&O at first used horses to haul trains through the city. Seeking a more efficient system, the B&O electrified 33/4 miles (6 km) of track, including a tunnel running the length of Howard Street. The 600-volt system used a small General Electric locomotive to haul trains, with their steam locomotives, into and out of Baltimore’s Mount Royal station. In New York City, the polluting steam locomotive was likewise banned south of the Harlem River after 1908, causing the New York Central to electrify its track with a third-rail DC system between Grand Central Terminal and Croton, New York, allowing for an open cut to be converted to a tunnel along Park Avenue. Top: The L5 electrics of the Pennsylvania Railroad were intended as a multipurpose locomotive, capable of easily being converted from passenger to freight service, AC to DC, and overhead wire to third rail pick-up shoe. The third rail shoe-equipped 3930, called Old Rail Spreader because of its rigid non-articulated construction, has been rebuilt with a high hood, but clearly shows the jackshaft system for transferring power from the motor to the wheels. Middle: This is New York Central No. 277, a 2-B- B-2 “T-motor” locomotive with third rail pick-up, in the Bronx, New York, in 1936. General Electric produced thirty-six of the units between 1913 and 1926, and they were the standard power for all trains from Grand Central Terminal to the engine change points at Harmon and White Plains. 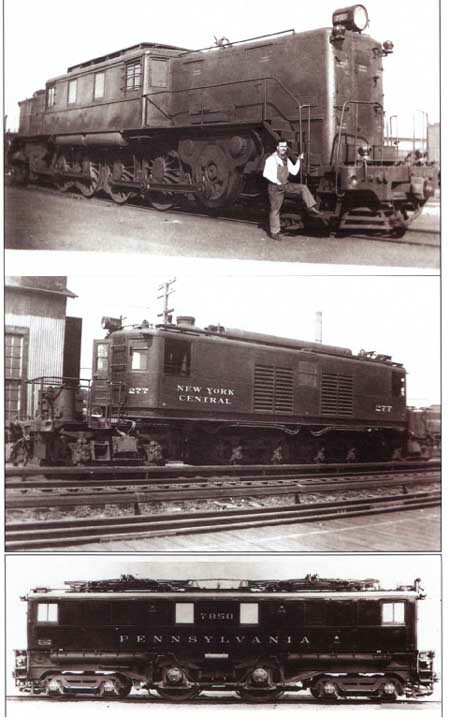 Bottom: The Class 01 2-B-2 (0-4-0) box-cab electrics of the Pennsylvania Railroad resulted from a technological breakthrough that enabled small, powerful, axle-mounted, AC electric motors to be built, and ended the jackshaft era for the Pennsy. The first eight O1’s, built in 1930 and 1931, were equipped with electrical equipment made by Westinghouse, General Electric, and Brown-Boveri; the power output varied between 500 and 625 hp. Westinghouse Electric favored AC power, as opposed to competitor General Electric, which continued founder Thomas Edison’s preference for DC. Their first AC project in North America was for the New York, New Haven & Hartford in 1907. This 11000-volt. 250-cycle system is still used by Amtrak. The argument over AC versus DC was fierce. AC is easier and more economical to transmit over long distances, but DC traction motors are simpler and less expensive than AC motors. The New Haven’s electric locomotives were among the first to be operable with either AC or DC. A device called a thyristor greatly simplifies the technology that allows DC motors to operate on AC current. The great electrified systems of modern Europe also allow for the operation of locomotives on all the various voltages of the AC and DC systems in use. Ventilation problems in tunnels provided the impetus for many electrification projects. The Great Northern electrified the 2.6-mile (4.2 km) first Cascade Tunnel and its approaches in 1909, to relieve the smoke problems of steam locomotives operating in a confined space, and retained the system for the second Cascade Tunnel, at 7.77 miles (12.5 km) the longest in North America. The Simplon and St. Gotthard Tunnels in the Alps were also electrified soon after completion. The Great Northern, however, removed the electrification and converted to diesel-electric operations after improving the ventilation in 1956. The Chicago, Milwaukee, St. Paul & Pacific Railroad (Milwaukee Road) took a more complete approach. They began to electrify their route between St. Paul and Seattle in 1914, eventually installing the 3,000-volt, overhead-wire DC system on 902 route miles (1,450 km). Hydroelectric generators supplied sufficient current to operate their 521,000-pound (236,000 kg) 3,840-hp locomotives, called Bi-polars, and the “Little joes,” named after Joseph Stalin because the engines were embargoed before shipment to Russia. After World War II, the Milwaukee Road dismantled the electrification in favor of diesel-electric locomotives. The Pennsylvania Railroad, in keeping with its reputation as “the Standard Rail road of the World,” was the most serious proponent of electrification in North America. Beginning in 1928, the Pennsy embarked on a massive project that installed a 25-cycle AC system, similar to the New Haven’s, on 670 route miles (1,100 km) made up of 2,200 miles (3,500 km) of track over the following decade. Virtually their entire main line east of Harrisburg, Pennsylvania, was electrified for both freight and passenger traffic, and the legendary Raymond Loewy-styled GGI locomotive was designed for use on this route—the last major electrification project in North America. The GG1 was the pride of Pennsylvania Railroad electrification. Here, a double header led by No. 4887, in Penn Central livery, hauls a freight train on a snowy New Jersey day in 1978. In the early 1960s, the Pennsy looked to General Electric for replacement of these 1930s-era electric units and bought sixty-six 5,000-hp units designated E44, but the GG1s toiled on anyway, side by side with the newcomers. The E44s were retired in 1984, when Pennsy successor Conrail abandoned freight electrification, but the venerable GG1s continued to roll under Amtrak. Today, the New Haven to Boston to New York to Philadelphia to Washington route is operated by Amtrak as their Northeast Corridor, a heavily traveled high-speed passenger line. The physical plant was substantially rebuilt beginning in the 1970s, and speeds of up to 120 mph (192 kph) were authorized. The adopted GG1s were joined by the new Metroliners, fast but visually straightforward self- propelled cars that could be assembled into trains as required. Amtrak soon experimented with other more conventional locomotives and train sets. 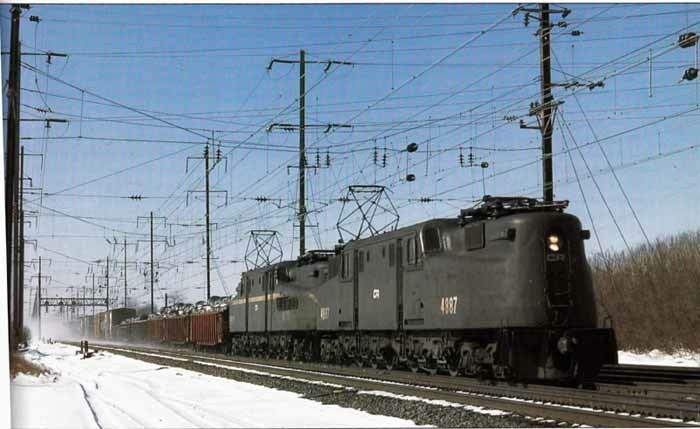 GE delivered an order for twenty-six 6,000-hp E60s from 1972 to 1976, in two variations, for high- speed service on the Corridor. Tracking problems limited the E60s to 90 mph (144 kph), which Amtrak found unacceptable on this 120-mph (192 kph) line, so a number were sold. Not content to stick with American products, Amtrak imported two loco motives for testing in 1977. The Swedish 80-ton (72 t) unit produced 6,000 hp, but was returned as being too light. The French unit was rated at 7,725 hp, but was also sent back when the tests were inconclusive. An order was placed for sixty-five AEM7 locomotives that were a variation of the Swedish ASEA unit, and were built in the United States under license to EMD. The value of the Northeast Corridor electrification is well recognized, and great improvement in signaling and dispatching systems is currently under way. Unfortunately, the tremendous capital expenditure necessary has prevented further expansion in the United States or Canada outside of transit systems in urban areas. Extension of the former Pennsy’s system, from Harris- burg, over the Alleghenies via Horseshoe Curve, to Pittsburgh has been studied many times but never initiated. Minor exceptions are coal mine-to-power plant railroads: the Muskingum Electric Railroad in Ohio; the Black Mesa & Lake Powell in Arizona; and the Deseret Western in Arizona are typical of such installations. Much of the world, on the other hand, has embraced electrically powered main line railroads. The Alpine tunnels inspired many of the early installations, in an effort to eliminate the smoke problems caused by steam locomotives. The Swiss Federal Railways experimented with main-line electrification as early as 1910 on the Berne to Lötschberg to Simplon Line and was completely electrified early on. The rest of Europe proceeded in the same direction. In Holland, the entire rail system south and west of the Zuider Zee was rebuilt following World War II and electric power prevailed, with rather mundane self-propelled multiple-unit trains providing efficiency in exchange for the wonderful diversity of steam power that prevailed before the war. The French were even more ambitious, having decided on a complete rebuilding of important junctions, including full remote control, as well as realignment of track in open country so that higher speeds would be possible. Prewar speeds had been limited to 75 mph (120 kph), but electrification, signaling, and control changes raised that to 90 mph (140 kph). In the l980s, the Mistral was very impressive, covering the 98 miles (157 km) between Paris and Dijon in one hour, and many trains regularly ran at 125 mph (200 kph). The revolutionary TGV, running on a private right-of-way, has regularly operated at 125 mph (200 kph). Above, left: General Electric built sixty six C-C trucked 4,400-hp E44s for the Pennsylvania Railroad in 1960. The ignitron rectifier locomotives converted the AC power from the catenary to DC power for the traction motors, simp4fjiing maintenance. Above, right: Despite an abundance of1 power, New Zealand has been slow to move toward heavy electrification. The commuter district around Wellington and the Otira Tunnel are the major exceptions. Britain made an early commitment to diesel power, and therefore was reluctant to embrace electrification, but considerable work has been done in dense traffic corridors. Many members of the former British Empire have gone further. India has electrified 3,000 route miles (4,800 km) since 1947, including both suburban service and mountain grades. South Africa, having plenty of coal, but little oil to encourage dieselization, has fully embraced electric power while retaining steam. Beginning in 1926, with 3,000-volt DC, the mileage under wire has grown to more than 3,500 (5,600 km), and the number of electric locomotives exceeds 1,700 Australia, New Zealand, and Canada have reserved electric railroads primarily for commuting and heavy corridor use, although British Columbia Railway built a new line from Anzac, British Columbia, some 80 miles (128 km) inland, to serve new coal mines This line was electrified at 50,000 volts, 60 cycles, and operated with 6,000-hp units built by GM of Canada with ASEA licensed electrical equipment. While the higher construction costs for electrification tend to relegate new installations to suburban commuter lines, heavily trafficked and relatively short corridors, or captive coal mine service, growing interest in high-speed service and fluctuating fuel prices mean that the situation is always in flux. It seems safe to say that locomotives drawing electricity from a distant power plant will share the load with those that generate their own power from on-board generators for the foreseeable future. Groups of powered and unpowered axles mounted in a single swiveling or articulated unit (or truck) are separated by a plus sign(+). Thus, a switcher with three powered axles that don’t swivel would be described: O—C—O. A switcher with a pair of swiveling trucks, each having two powered axles would be: B + B. A heavy-duty freight or passenger locomotive, like the GG1, with two articulated frames each supported by a pair of trucks having two unpowered axles or three powered axles is a 2—C + C—2. The Milwaukee Road Bi-polars were described as: 1-B+D+D+B-1 and their Class EF3, which was made up of three separate units semi-permanently coupled together, was: (2-B+B)+(B+B)+(B+B-2). This sys tem was not universal in the beginning— Pennsy preferred to call the GG1s 4-6-6-4, as in the Whyte System. Ultimately, the letter/number system came to describe diesel-electric locomotives as well.